Ireland beat Ukraine 3-0 to book a semi-final spot in the Eurohockey Championships II tournament in Prague with one pool game still in hand. Ireland beat France 7-1 in their opening game on Saturday and sit at the top of Pool A with Tuesday's game in the Czech Republic still to come. 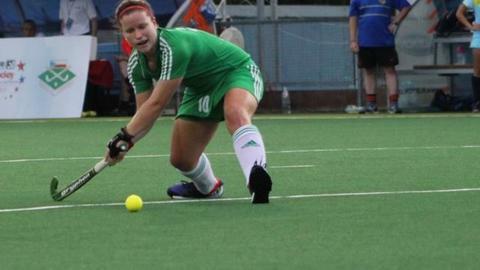 Yvonne O'Byrne, Naomi Carroll and Chloe Brown were the scorers for Ireland. "It wasn't the performance we were looking for but we're in the semi-finals," said Irish coach Graham Shaw. "That's what is most important and we're happy with the 3-0 scoreline although Ukraine worked hard and made it very difficult for us. "We'll review the video and look forward to the next game on Tuesday, before preparing for a semi-final on Thursday." O'Byrne broke the deadlock as she deflected a penalty corner shot into the roof o the net. Carroll gave Ireland a bit of breathing space when she fired home in the 48th minute and then in the final action of the match, Brown stepped up and expertly dragged the ball into the top left corner to make the final score 3-0. The Irish need to finish in the top two in the tournament to earn promotion to the top flight of European competition.